I know that seven-year-old Emma has especially enjoyed a lesson at school when she comes home and repeats it for her younger brothers and sister! 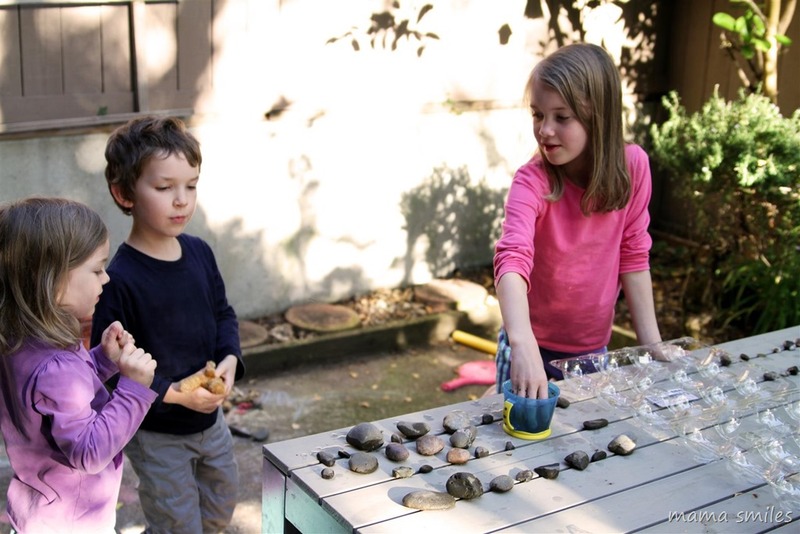 On Friday, she created an afterschool activity for five-year-old Johnny and four-year-old Lily all about studying rocks – washing them, and classifying them based on different characteristics. 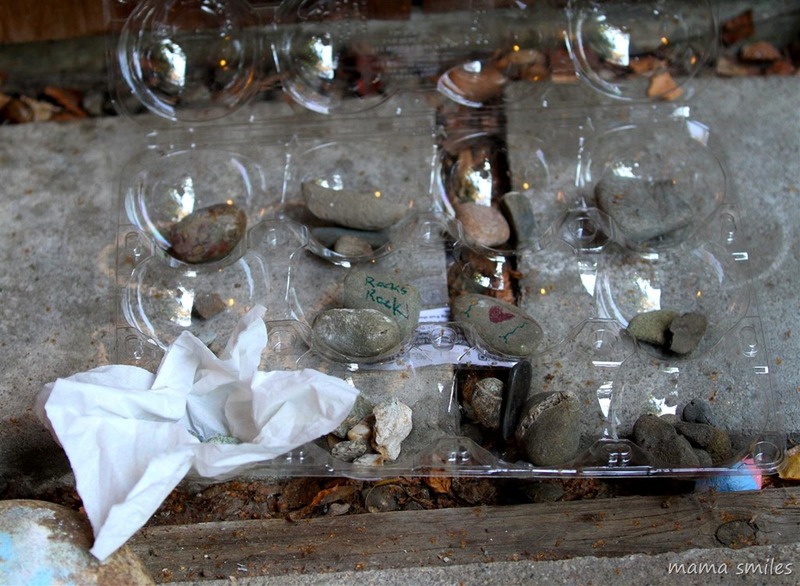 A plastic apple tray from Costco makes the perfect rock home! The heart and “rocks rock” rocks were decorated with Pip-Squeaks markers (affiliate link), which I love for their vibrant colors and washability. 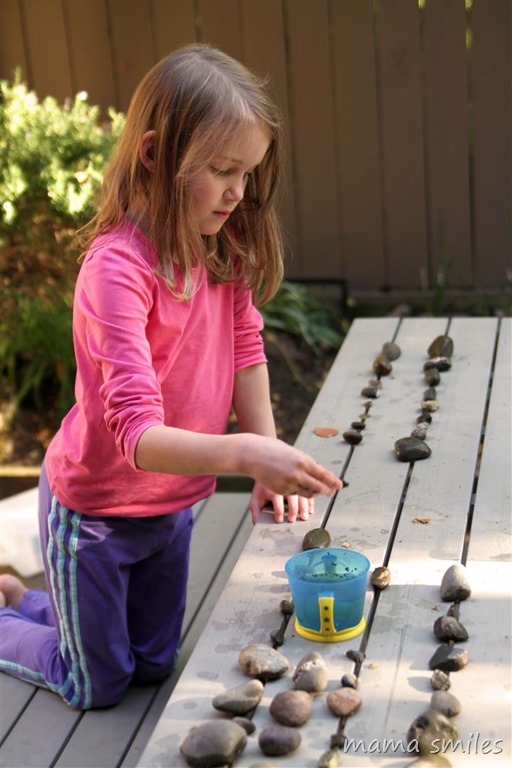 This could easily be made into a concrete lesson on rocks (check out this awesome rocks for kids resource), but I left the kids to their creative play. 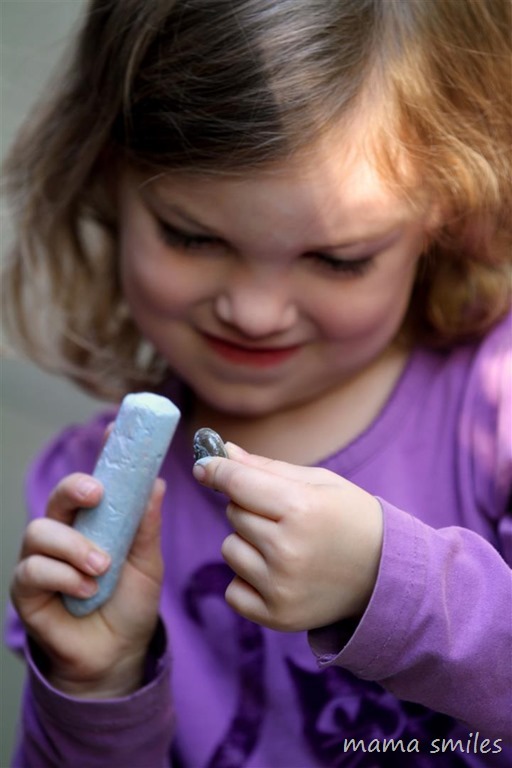 There’s a time for structured learning, and a time for the imaginative exploration that builds curiosity for structured learning! How fun,my girls are fascinated with rock. This will be a great way to do something productive with their rock collection! It is a lovely little space. There are trees surrounding the outside of the gate, which makes it even nicer, even if they don’t belong to us! I love that Emma is such a good teacher for her younger sibling. They definitely look very taken by this lesson! I am glad that you are all settling in! It is really nice to be settling in! I am hoping to finish unpacking this week, but today I didn’t unpack anything as I was catching up with day-to-day chores and grocery shopping! Love seeing the kids having fun with rocks in their new backyard! Rocks in a new area are one of my favorite things to discover too! How great that Emma wanted more “rock time” after school! Those apple trays from Costco are amazing for kids… My last one lasted through 2 years of wear and tear. They really are great! My kids have used them for all sorts of things over the years! I love that Emma holds classes for her siblings! It looks like they really enjoyed it! How wonderful that she likes to teach her younger siblings! My son loves to collect rocks. This is such a great way to use the rocks he has gathered. I think rocks are a really cool thing to collect. There is so much variety! How fun! Let me know if Emma wants me to send her rocks from MY backyard or general Boston area! My girls were really into rocks, especially “Quartz crystals”. I think I saved all their rock collections in a certain part of the yard. She would LOVE that. We miss Boston!!! I have to admit geology is one of the areas of science I have very little interest in, my middle school science killed what little interest I had in it after having to collect 20 different kinds of rocks, and my Mom not being happy with the driving required for that assignment. I love that she’s so passionate to share with the younger kiddos. A teacher in the making? I could definitely see her going that route. She would be a great teacher!